The coolest gig of my life came out of the blue on a rainy Saturday of the cold, drizzly variety. It was in the spring of 2008, and I had a couple of days off work following a hectic month’s concert schedule. I’d had a slow start to the day, and was just settling in with the Books section of the Saturday paper, when the telephone rang. It was the estimable MJ, our Stage Manager, wondering if I might have a spare hour to bring my viola over to the concert hall and sub in for a sound check. MJ couldn’t find any violinists; they all seemed to have fled the city in the twelve hours since our concert the previous evening. “Sorry, what?” It seemed to me she’d said something about Leonard Cohen’s fiddle player. We all know a viola is a viola, and not a fiddle, but I wasn’t about to let that stop me. At the appointed time I arrived at the stage door, viola in hand, gawking at the lineup of transport trucks and tour buses parked outside. MJ showed me through to backstage, an area as familiar to me as my own living room, as it is, in fact, my regular place of work. But the place had been transformed. Curtains had been set up, turning the place into a maze of smaller rooms. The largest sound board I’ve ever seen blocked the stage entrance. “Leonard usually arrives at around four o’clock,” MJ whispered, as I unpacked my viola. Leonard. It was now three o’clock. My heart began to hammer. This was cool, it was just so cool. Not a second was wasted; immediately the sound engineer had my viola rigged with first this mic and then that one, as I returned to the stage again and again to play passages of solo Bach while crew came and went, adjusting mic stands and trying me out for sound in different places. After about an hour we were finished. As I packed up my viola backstage, I glanced through a partly opened curtain. A spotlight cut through the darkness, illuminating a small table. Why there was a spotlight backstage I’ll never know, but it was a sight I’ll never forget: the table was covered in white linen, and lined up on the white linen were five fedoras. I didn’t see Leonard Cohen that afternoon, but later, at the concert, the Business Guy and I were among a sold-out crowd of enraptured Cohen fans. The fiddle player was amazing, the band just so tight. And perched upon various musicians’ heads, Leonard’s included, were the five fedoras. 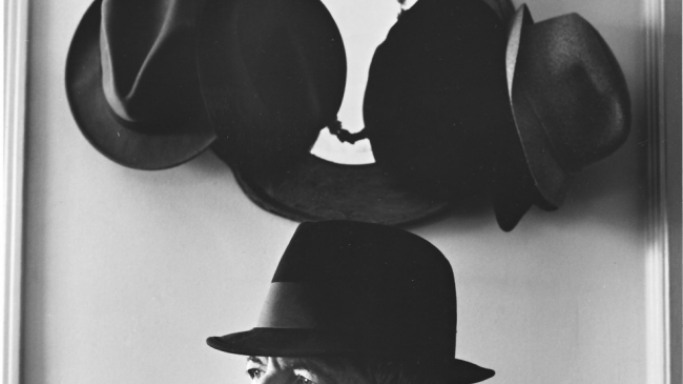 Tags: Five Fedoras and Leonard Cohen.